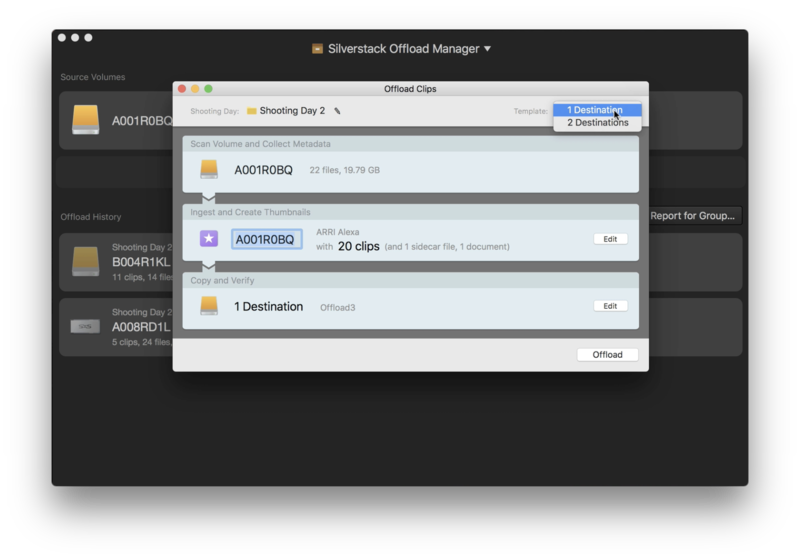 The Silverstack Offload Manager supports your offloading tasks on set: It enables secure backups, and documents your work in comprehensive reports. Besides these obvious gains, there are a number of advantages “under the hood” that the offload software brings with it. These may not be obvious at first, but can make your daily work on set significantly easier. In this blogpost we want to discuss some of these benefits. The offload of camera footage can be a challenging task. Often you have to offload multiple camera cards with different formats, ideally all at the same time. To make things easier for you, the Silverstack Offload Manager offers some convenient features that simplify the overall offload process. Imagine that you have to handle offloads for a multi-day project, and somebody asks you about the details of an offload that you’ve done on the first day. With the Silverstack Offload Manager you can easily look up individual offload jobs. Within each project, the software automatically structures offloads into groups. These groups can e.g. be organized after shooting days. In this case one group would hold together all offloads of one specific shooting day. The user can even adopt this structure to the folder structure of the drive by using the default path wildcards*. The default path wildcards (see screenshot below) create the according folder structure on the destination drive. This way the default path wildcards ensure an easy and well-structured order not just in the software, but also on the drive. 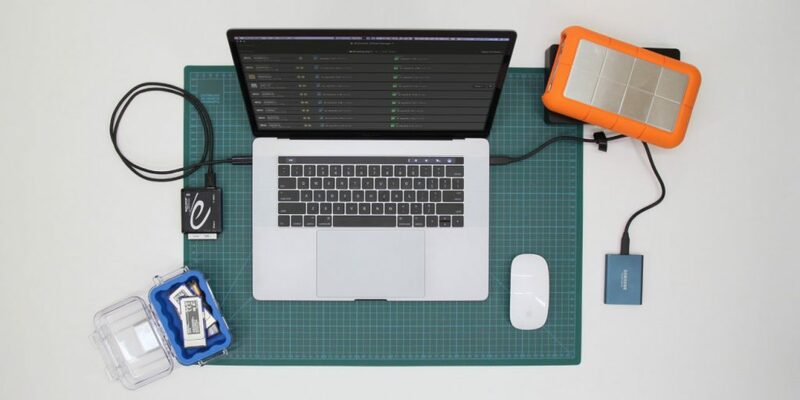 Over the course of a day you often receive multiple cards from different cameras or audio recorders that need to be backed up to different locations. The Silverstack Offload Managers allows you to pre-define different offloading settings as offload template. This way you can easily switch to the specific settings for the card type that has to be offloaded next. The offload templates hold together the complete offload configuration (including destinations, path wildcards, checksum methods, etc.). Once prepared and stored, the right offload configuration can be changed in a second when the next card comes in. Multiple offload templates can also be used e.g. The Offload Manager always finishes the copy process first and then automatically attaches the verification process. The status of both processes is documented separately in the software, so you know at any time about the current status of your copy and verification tasks. With the Silverstack Offload Manager you can provide the right metadata to the right people, so they can make best use of it for their following work. To do this you can choose from a clearly structured set of table layouts for the report. The offloads report documents all offloaded media. It includes the total time of all shot clips, as well as all format types that were used. All format types are automatically recognized by the Offload Manager, and summarized comprehensively. Editors, Cinematographers, and the production gain additional value from the additional information about formats. This way the data management position is strengthened without additional effort by the data wrangler. By working with the Silverstack Offload Manager you not only make sure that your backups are secure and your work is well-documented. You also benefit from a straightforward and simple offload process that is tailored to your needs and the challenges you face on set. Give the Silverstack Offload Manager a try, and discover the best benefits for yourself! 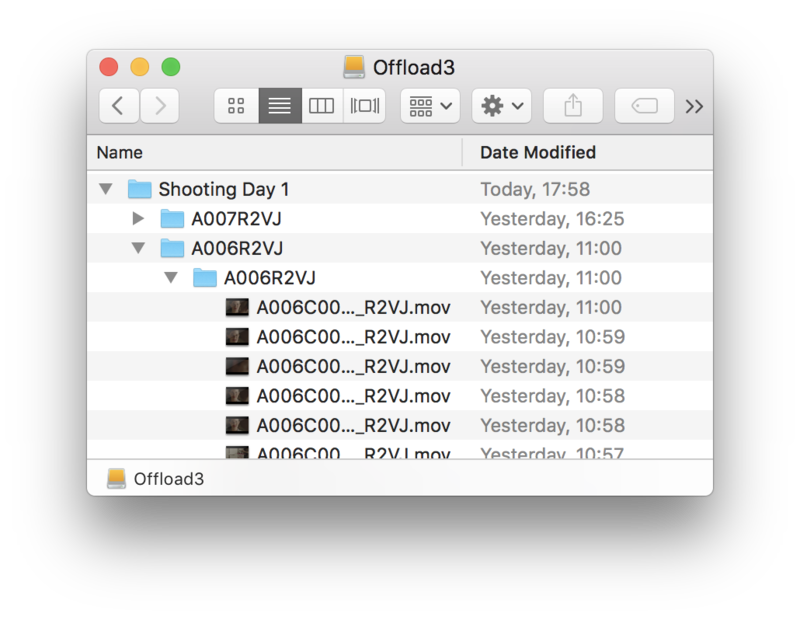 *Path wildcards make the destination folder structure definable by using metadata from the footage. Test the Offload Manager with our free 10-day trial!